When it comes to the valuable exercise of praying the Scriptures, praying for love is an excellent place to start. According to Jesus, the two greatest commandments and the sum of all the others is: “You shall love the Lord your God with all your heart and with all your soul and with all your mind. This is the first and great commandment. And the second is like it: You shall love your neighbor as yourself” (Matthew 22:37-39). God says through Paul in I Corinthians 13 that among faith, hope, and love, “the greatest of these is love” (verse 13). Jesus told His disciples that the world would know they’re Christians by their love for one another (John 13:35), and taught that we are to love our enemies (Matthew 5:44). 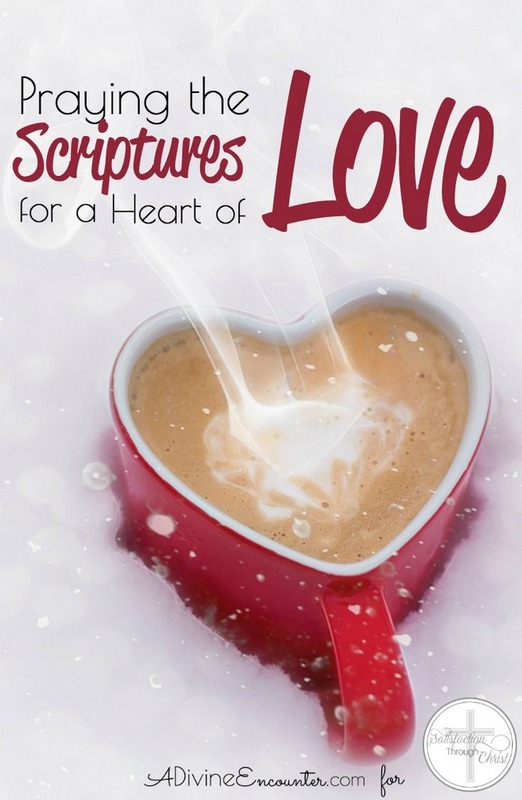 Considering the importance of love throughout the Scriptures, it comes as no surprise that love is the first characteristic of Holy Spirit fruit. And yet from my own experience and from the testimony of others, praying for love isn’t among our most common requests. It occurs to me that we will want to pray for love only when we realize how little genuine love exists in our hearts. This happens when we immerse ourselves in God’s Word, absorbing the height and depth and breadth of God’s love for us as demonstrated through Christ, and realizing how pale our own love is by comparison. Will you join me in lifting to the Lord these prayers for love? 1. )Pray that you would be firmly established in the love of Christ, and that you would begin to grasp the love of Christ that surpasses knowledge, that you may be filled with all the fullness of God (Ephesians 3:17-19). 2. )Ask God to grant you a love for Him that fills your heart, your soul, your mind, and your strength (Luke 10:27), and that your love would be displayed through your obedience to Him (John 14:23-24). 3. )Pray that you would love other believers in a way that proves to the world that you are a follower of Christ (John 13:35). 4. )Implore the Lord to help you put up with people in your life who are difficult to love. Ask Him to enable you to forgive quickly, in the same way you’ve been forgiven. Above all, affirm to the Lord your desire to put on love, which bonds everything together (Colossians 3:13-14). 5. )Praise God for His love for you, demonstrated through Christ’s death on the cross while you were still a sinner (Romans 5:8). 6. )Pray that He would instill in your heart His love for the lost (John 3:16). 7. )Confess to the Lord any hatred you have toward your enemies, and ask Him to give you a supernatural love for them instead (Matthew 5:44). Pray God’s blessing for any specific people who come to mind, and ask your Father to show you opportunities to do good to them. 8. )Request that God would refine the love in your heart, making it patient and kind, not envious, boastful, proud, rude, self-seeking, or easily angered. Ask Him to give you a love that doesn’t rejoice in wrongdoing, but rejoices with the truth. Pray that your love would be free from conditions or manipulation, and that it would be an unfailing love that bears all things, believes all things, hopes all things, and endures all things (I Corinthians 13:4-7). 9. )Ask God to keep your love free from ulterior motives, and instead centered upon the lordship and preeminence of Christ (Colossians 1:15-20). 10. )Pray that the Lord would purify your love from the poison of hypocrisy, motivating you to express love through action, not with words alone (I John 3:18). Dear Heavenly Father, thank you for showing me what love is. I pray that you would open my eyes to the nature of Your love for me, and teach me how to love others with a love that is as rich and free as the love I’ve received so lavishly from You. It’s in the name of my Savior, Jesus Christ, that I pray. Amen. This post is an excerpt from my new book, Praying for Fruit: Praying the Scriptures for the Fruit of the Spirit. Get your free copy here.